Earn £30 worth of loyalty points when you buy this item. Good looks and manners will get you a long way, as this beautifully crafted three-piece suit demonstrates perfectly. Jacket: Tailored fit. Two button, single breasted. Angled exterior pockets. Four interior pockets. Centre vent. Fully lined. hand stitch detail. Four button cuff. Dry clean only. Our canvassed and lined suit jackets and blazers provide superior quality, and a fit that only improves over time. 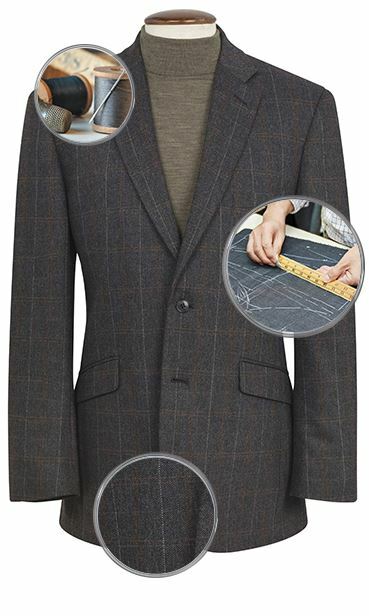 The structure, although hidden from view, plays an incredibly important role in keeping the proper shape of the jacket. It’s all about fit and form. Our jackets truly conform to your body’s shape and become a better fit the more often you wear them. With perfect drape a nice lapel roll and the ability to move without constricting, our jackets are a wardrobe staple. It’s the details that make the difference. Our jackets and blazers are created with their own personality. 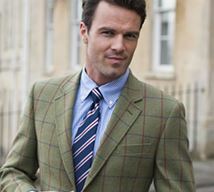 While the Otley is detailed with a classic notched lapel and metal crested buttons in bespoke fashion, the Harris Tweed jackets are exquisitely crafted from 100% virgin wool, hand woven by artisans in their homes in the Outer Hebrides of Scotland. Each piece bears the Orb Certification, the ultimate mark of authenticity. It’s like owning a piece of history. Determined to carry on the elegance and tradition of the world’s most prestigious mills and artisans, our jackets and blazers are crafted from the finest materials. 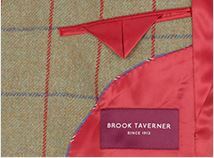 From certified Harris Tweed, Italian Moleskin, and 100% new wool to wool blends, our fabrics are second to none. 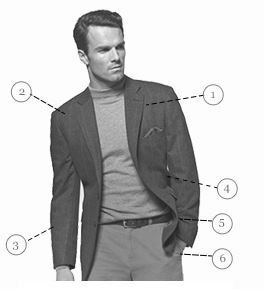 A tailored fit jacket will follow the natural flow of your body without being too snug or too loose. Trying on your jacket, look for a good fit while in your natural stance. A proper fit is shaped from the neck to the chest and shoulders to drape without wrinkles from tension. This allows the jacket to move freely with your body. A well-fitted shoulder lies flat and the shoulder seam should meet the sleeve of the suit right where your arm meets your shoulder. The button should close easily without pulling and the two sides should meet neatly without flaring or hanging forward off your body. Your jacket sleeve should rest just above the large bone in the wrist and at least a small band of the shirt cuff should always be visible. 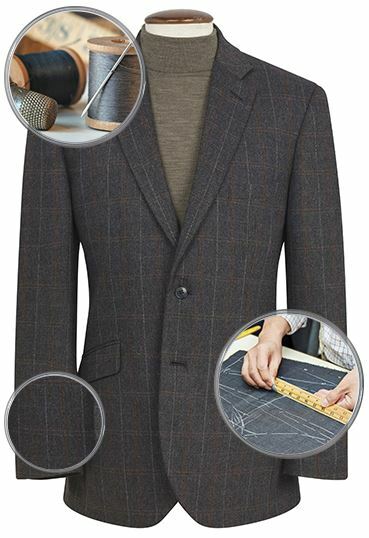 The tailored fit jacket is slightly shorter than the classic fit. This smart look is perfect with the slimmer suit style. It gives you an overall clean, contemporary, and streamlined look.